Posted on March 29, 2011 by M.E. It’s showtime! 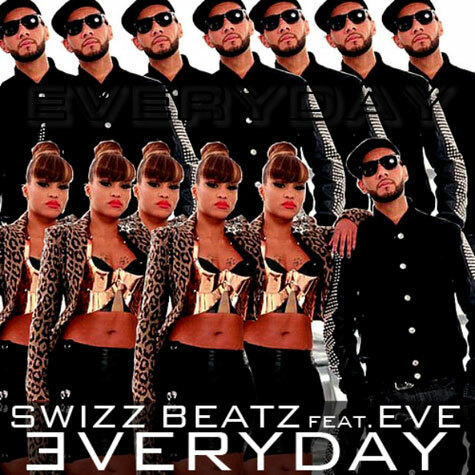 Swizz Beatz reunites with his Ruff Ryders cohort Eve on “Everyday (Coolin’),” the first single from his upcoming album Haute Living. Swizzy balls out on the weekdays and cools off on the weekend, name checking designer labels including Alexander McQueen, Louis Vuitton, Balmain, and Givenchy over the wailing instrumental. Beyoncé and her father are going their separate ways. 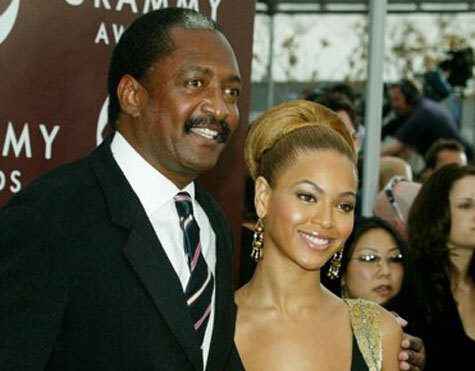 The superstar will no longer be managed by her father Mathew Knowles, it was announced today. Knowles managed his daughter since the start of her career as a member of Destiny’s Child and through her three solo albums. She is currently working on her fourth studio album, but new management has not been announced. Her Destiny’s Child bandmates Kelly Rowland and Michelle Williams previously split from Knowles to pursue solo careers. Posted on March 28, 2011 by M.E. 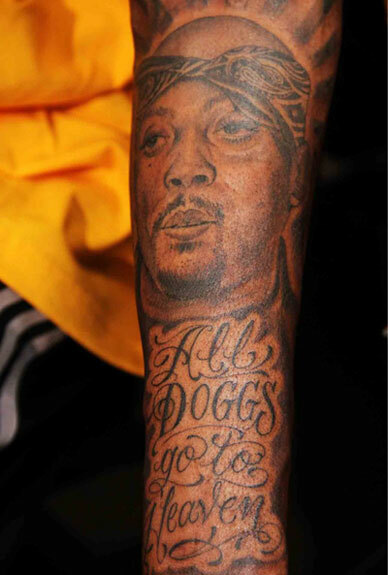 Snoop Dogg kept the memory of his West Coast brother Nate Dogg alive by tatting a picture of his face on his left forearm along with the words “All Doggs Go to Heaven.” The new ink by famed tattoo artist Mister Cartoon was done late Friday and serves as a lasting tribute to his lifelong friend. 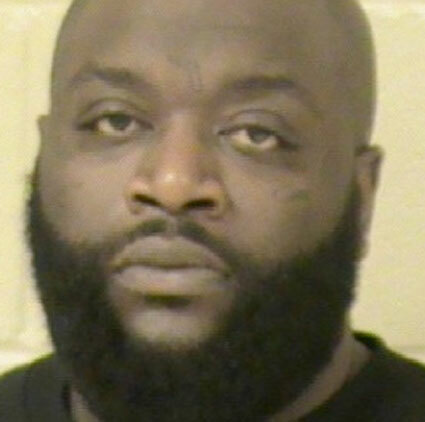 Rick Ross was arrested for marijuana possession while in Shreveport, La., for a paid club gig on Friday night. TMZ reports that police detected a strong smell of marijuana coming from the rapper’s hotel room. When cops investigated, they found approximately one gram of weed in plain sight. Ross was booked and released on a misdemeanor summons. He continued as scheduled on the “I Am Music II” tour, sharing the bill with Lil Wayne and Nicki Minaj in Philadelphia this past Saturday. Thousands of Nate Dogg’s family, friends, and fans gathered to say goodbye to the G-Funk trailblazer, born Nathaniel Hale, in his hometown of Long Beach, Calif., on Saturday morning (March 26). His West Coast peers including Snoop Dogg, Dr. Dre, Game, DJ Quik, Kurupt, Xzibit, and more made their way into the Queen Mary Dome on a cloudy day as the hip-hop icon was laid to rest. A wooden coffin covered with red and white flowers sat before the mourners as they shared tears, laughter, and testimonials from the Grammy-nominated crooner’s storied life, closing the ceremony with a choir. Porcelain Black rocks out with Lil Wayne in her debut video for “This Is What Rock N Roll Looks Like,” the first single from her Universal Republic debut. The 25-year-old glam rocker, who describes her music as a mix between Marilyn Manson and Britney Spears, is currently on tour with Weezy and Nicki Minaj. Posted on March 25, 2011 by M.E. In what stands as a major global music relief effort to benefit those affected by the earthquake and tsunami in Japan, over 30 of the biggest names in contemporary music have joined together for the worldwide release of “Songs for Japan,” a compilation of 38 chart-topping hits and classic tracks, available worldwide on the iTunes Store for $9.99 starting today (www.itunes.com/songsforjapan). The society will use the funds for the ongoing provision of immediate relief and for eventual recovery support to the affected population. The artists participating on “Songs for Japan,” the music labels and music publishers have waived their royalties and proceeds from the worldwide sales of the album to ensure that the JRCS receives as much support as possible from this global initiative. Participating in “Songs For Japan” are Beyonce, U2, Bob Dylan, Lady Gag, Bruno Mars, Katy Perry, Rihanna, Nicki Minaj, Justin Timberlake, Madonna, Eminem, Neyo, Bon Jovi, Sade and several more. Check out the tracklisitng for “Songs For Japan” below.